Which Of These Film Directors Planted 500 Acres Of Corn To Avoid Using CGI? Which Computer Engineer Is Best Known For Giving The Mother Of All Demos? While CGI (computer generated imagery) has given film makers enormous freedom to create powerful virtual sets, characters, and effects, many directors feel strongly that there’s no substitute for real props and real effects. In that regard, despite the fact that Christopher Nolan’s 2014 sci-fi hit Interstellar includes a lot of CGI—it is a sci-fi film about wormholes and interplanetary travel, after all—there are interesting cases in which Nolan goes out of his way to minimize the use of CGI. The biggest example is the corn field growing on the farm where the film’s protagonists live. While it would be easy to write off the enormous fields of green corn around the farm as a CGI trick (after all, what isn’t a CGI trick these days? ), it’s actually real corn. 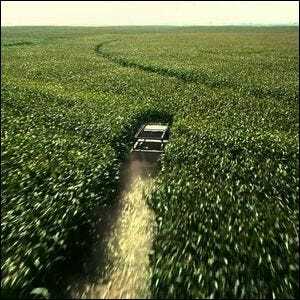 Now, a field of real corn out in the middle of nowhere isn’t exactly revolutionary, but what makes the corn in Interstellar interesting though is that Nolan had the corn specifically planted for the movie around the farm house he wanted to use for the film. The corn that stretches out as far as the camera can pan? That’s 500 acres planted specifically for the film. Not only did the corn look great in the film, and certainly better than CGI corn ever could have, but our favorite detail about the saga of the Interstellar corn is what happened after the shooting wrapped up. Despite the stunt work and the general mayhem in the fields, enough of the corn survived that the harvest from the “prop” corn was profitable and paid for the whole experiment (and then some).